Spacecraft BepiColombo Poised For Mission To Mercury The European Space Agency's BepiColombo will take seven years to reach the innermost planet in our solar system, where temperatures at the surface can reach 800 degrees Fahrenheit. 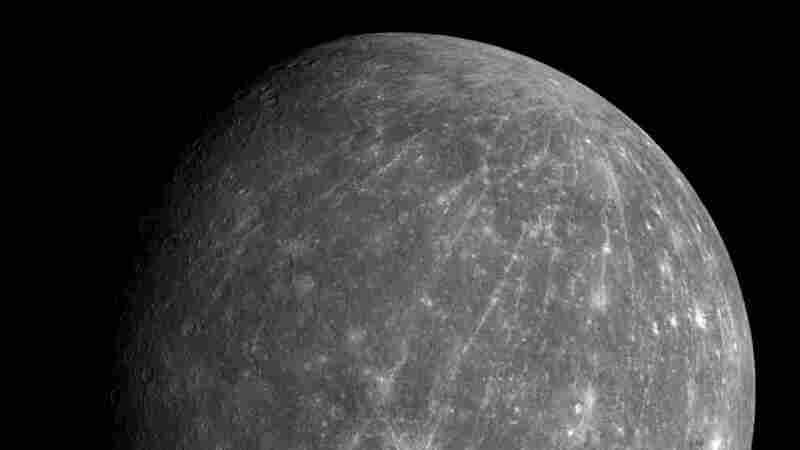 This October 2008 photo shows Mercury during the Messenger spacecraft's second flyby of the planet. The European Space Agency's BepiColombo will take seven years to reach the innermost planet in our solar system. BepiColombo, named after the Italian mathematician and engineer Giuseppe "Bepi" Colombo, launched at 9:45 p.m. ET Friday aboard an Ariane 5 rocket from a spaceport in French Guiana. Mercury also has an unusual composition. Like Earth, it has a metal core. But Mercury's metal core takes up 80 percent of the planet. One of the most intriguing things about Mercury is that despite the blistering temperatures on the sunny parts of the planet — temperatures that can reach 800 degrees Fahrenheit — there are places in craters near the poles that never see the sun. "And we might be able to learn something about that freshly exposed material," she says. "So it's kind of fun to think that even in its demise, Messenger could still contribute to advancing our knowledge of Mercury."